This year marked the 45th anniversary of Earth Day, an occasion first celebrated in 1970. It also marked the 45th anniversary of the National Environmental Policy Act or NEPA as well as the 45th anniversary of the Environmental Protection Agency (EPA), the government body most widely associated with monitoring and enforcing regulations governing air and water quality as well as pollution and its effects. It is not surprising then, that the 1970s are often known as the environmental decade and that the years of the Nixon presidency (1969-1974) are usually those most often associated with the implementation of an environmental agenda, especially at the federal level. 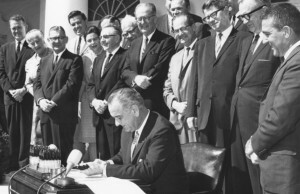 Lyndon B. Johnson, Nixon’s predecessor in the oval office, also had a robust conservation vision, driven, in large part, by his wife, Lady Bird Johnson, as well as his influential Secretary of the Interior Stewart Udall. Many National Seashores and Lakeshores, like Indiana Dunes, Point Reyes and Fire Island, gained designation during the Johnson Administration as did National Parks such as Canyonlands and North Cascades. Beautification initiatives also gained widespread support, including the famous highway clean-up / planting efforts of the First Lady. Additionally, the role of non-governmental organizations shifted greatly during this period. NGOs expanded their influence and reach, as advocates challenged the public sector on many of its policies, especially in the realms of water management (ex. dam building in the western U.S.) and regulation of industry and industrial contaminants. Passage of the Wilderness Act in 1964 is perhaps the best known instance of the increasing influence of citizen-driven conservation and environmental initiatives. Before the early 1960s, the federal government played a very limited role in funding land conservation outside of federally owned lands, which were predominately west of the Mississippi River. Providing opportunities for outdoor recreation, especially in areas close to urban centers, was left largely in the hands of state and local government, entities that often struggled to find adequate resources. LWCF, along with an Urban Open Space Program funded by the Housing and Home Finance Agency (later HUD), created an entirely new pool of funds for the protection of landscapes significant for their ecological and cultural values (which were, of course, often tied together). These programs were not perfect. Urban areas, in particular, continued to receive proportionately less funds over time, though some efforts have been made to address this imbalance. Additionally, the LWCF’s chief funding source, royalties from off shore drilling, is ironic at best, especially given the ever more dramatic effects of climate change on the planet. The pursuit of other revenue sources must be prioritized moving forward. Nonetheless, the achievements of the LWCF are impressive, over 5 million acres of federal land protected and over 40,000 projects supported on the state side of funding, just to name a few of the more notable statistics. With one month to go before funding expires, it is time for Congress to act to ensure that this “comprehensive and far-reaching outdoor recreation program” to quote Stewart Udall continues to play a key role in conservation for at least another half-century. 1. WHITE HOUSE CENTRAL FILES, SUBJECT FILE: Memo, Stewart Udall to Joseph Califano, 2/9/66, Ex NR, Box 5, WHCF, LBJ Library. A great summary and a great reminder! What’s more, the fund-limit was expected to be increased. And it was increased, authorized at $900 million per year in 1977. It’s been at that level since. That $900 million would easily be over $3 billion in today’s dollars.